Dozens of American River College faculty and creative writing students spent Thursday night speaking with published authors and enjoying pastries on the opening night of SummerWords. 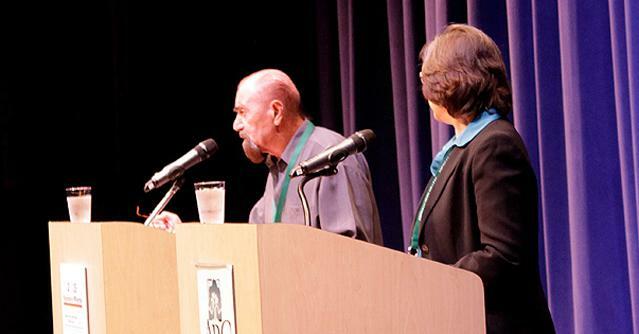 SummerWords is a creative writing festival hosted by American River College, co-chaired by English professors Christian Kiefer and Michael Spurgeon. After participants had the chance to meet and discuss their hopes for the weekend in the lobby of the ARC theater, they went inside to hear poetry readings from two poets published by Ad Lumen Press. “As far as I know (Ad Lumen) is the only fully operational small press being run out of a two year institution,” Kiefer said. Winner of the 2010 Iran Annual Book Prize Ziaeddin Torabi took the stage to read his poems in Farsi before a translator read them in English. “This represents years of my work,” said Torabi. Gourdine said that the poems, “Father Faith” and “What She Carries”, were inspired by childhood events. Workshops, readings and panels associated with the SummerWords festival will take place on campus through Sunday afternoon. Be the first to comment on "SummerWords opens with poetry and pastries"